"...of when static *interfaces* shine..."
"...of when static *imports* shine..."
given we're talking about Static Imports, and Java has a notion of Interfaces elsewhere. Agreed. That should definitely say imports! Added to the errata; thanks. Going for 1Z0-803 or 1Z0-808? 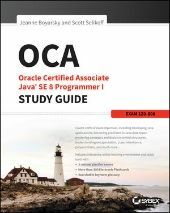 OCA 8 Book: Sybex vs Oracle Press?